I just arrived back home from the most amazing trip around the world! It’s that time of year when libraries are kicking off Summer Reading Programs. This years theme in many libraries is “One World Many Stories”. How perfect a fit the CD Tales From Around the World is to that theme. The story adventure begins with a classic Anansi story from Ghana, we were right there the sounds of the great river slipping past and the spirits singing. Soon I was swept away through Russia, England and Ireland. I spent time with a lizard and a deer down Mexico way and moved round the far side of the globe again before stopping for my favorite in the collection a story from France ” The Wooden Shoe Christmas”. I left that snowy scene and in moments was in the sunny tropics for another Anansi Spider tale. Mike Lockett pulled out all the stops as the saying goes, this CD storytelling collection done with sound effects, bits of music, voiced dialects, and delivered just like you were sitting in front of him made for great listening. It is a great travel CD in two ways, one for its broad sampling of world stories, the other pop Tales From Around The World, in the car CD player on the way to vacation and collect some back seat Peace! 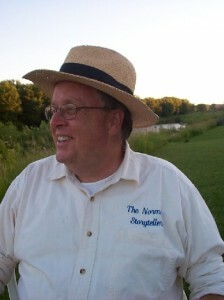 Stop by Mike Lockett’s website maybe you can catch a live performance of Tales From Around the World with the Normal Storyteller near you!